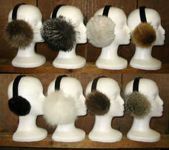 Wildthings Fur offers fur hats, womens hats, russian fur hats, rabbit fur hats, custom fur hats and much more. Wildthings Fur offers fur mittens, skunk fur mittens, beaver fur mittens, muskrat fur mittens, coyote fur mittens, raccoon fur mittens, and much more. Wildthings Fur offers ears muffs including raccoon fur ear muffs, blue fox fur ear muffs, red fox fur ear muffs, mink fur ear muffs, arctic fox fur ear muffs, beaver fur ear muffs, grey fox fur ear muffs, and much more. Wildthings Fur offers raccoon fur head bands, beaver fur head bands, coyote fur head bands, blue fox fur head bands, mink fur head bands, arctic fox fur head bands, silver fox fur head bands, grey fox fur head bands, red fox fur head bands, and much more. Wildthings Fur offers fur seat covers, sheepskin seat covers, motorcycle seat covers, sheepskin rugs, fur bikini, and much more. Wildthings Fur offers fur blankets, fur scarves, and much more. Miscellaneous Fur Products can be found here at Wildthings Fur. Enjoy the added warmth and superior water resistance of a beaver fur hat. Originally a fur that played an important role in the lives of Native American Indians, coyote fur continues to enjoy popularity in many fur clothing articles today, particularly coyote fur hats. Our Dakota Coyote Mountain Man Hat includes the coyote face in the design of the hat! Silver fox fur is extremely soft and silky to the touch, and the silver color is very rich looking and goes with almost anything! Our Mongolian and Musher hats feature fur flaps for aditional protection against the wind and cold. All of our men's and women's fur hats are available in Red Fox Fur because of its warmth and comfort. More rare than white arctic fox fur, blue fox fur is also very soft and very warm, and makes the wearer feel as rare and precious as the blue furred arctic fox itself! Raccoon fur is lnger-haired fur, and it's characteristic grey and black strippings make it a very popular fur. Because they are native to North America and much less rare than other fur bearing mammals, raccoon fur is also less expensive. All of our men's and women's fur hats are available in Red Grey Fur because of its warmth and comfort.